The Solo is designed to easily give single rooms and smaller installations powerful control functionality at a cost effective price point. Key features include an Ethernet connection, a generous variety of commonly used control ports, two expansion slots, a powerful rules and scheduling engine and cloud monitoring. 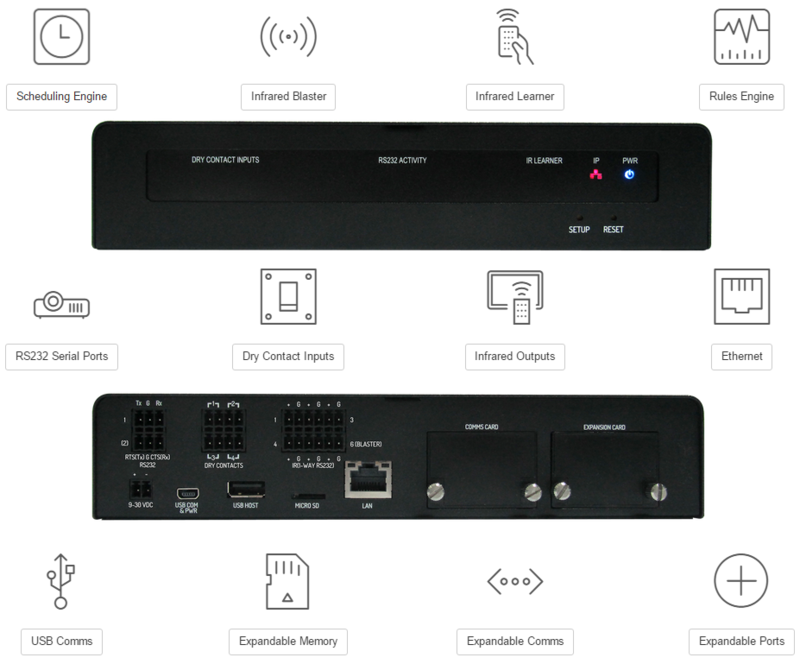 A built in Ethernet port gives the Solo immediate and simple connectivity to any standard network, while the communications expansion slot allows the user to easily add other protocol cards such as the DALI expansion card – which will be available soon after product launch. Along with all the standard control ports you would expect, the Solo also features 10 built in high power IR Blaster LEDs. The Blaster LED’s flood an area with infrared, allowing for wireless control of devices with an IR receiver. The built in IR Learner means that the user can learn codes directly on the Solo itself, with no additional equipment required. A range of control port expansion cards will also be available soon after launch, these cards will allow for the user to customize the Solo to suit their requirements. The ability to add additional RS232/422/485 ports, IR ports, relays or other control ports will be very simple and cost effective. Open protocols will make it simple to interface with third party control systems, and integration with CommandFusion’s own iViewer mobile application will be a simple affair. No software to install, just connect the Solo to the internet and launch your browser to Control Center to discover your Solo and start configuring it right away. No internet? No worries — You can still use your browser to configure the Solo. Just type it's local IP address into your browser to get started. See a quick run through of configuring a Solo below. To pre-order the Solo, click the button below.